Takeaway: A hybrid anode system that combines the elements of realkalization, cathodic protection and galvanic protection can be used as a protection system for the concrete element or the whole structure. Corrie Cook is affiliated with The Australasian Corrosion Association (ACA) and can be contacted using the options on the right. For info on how we work with industry partners click here. This paper is a summary of the new technology being used to extend the life of bridges on the State Highway 16 Causeway Project near Auckland. The technology is built on work discussed at C&P15 in Adelaide last year and follows the paper on the first use of Hybrid CP presented to C&P 13 in Brisbane in 2013. The hybrid anode system combines elements of realkalization, cathodic protection and galvanic protection, which can be applied as a global or a targeted protection system for the concrete element or the whole structure. 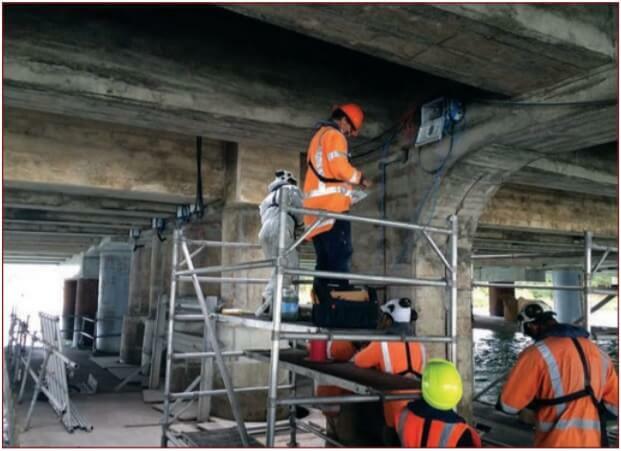 In the UK and Australia, investigations have been conducted into the occasional positive effects of interrupting cathodic protection on reinforced concrete structures. 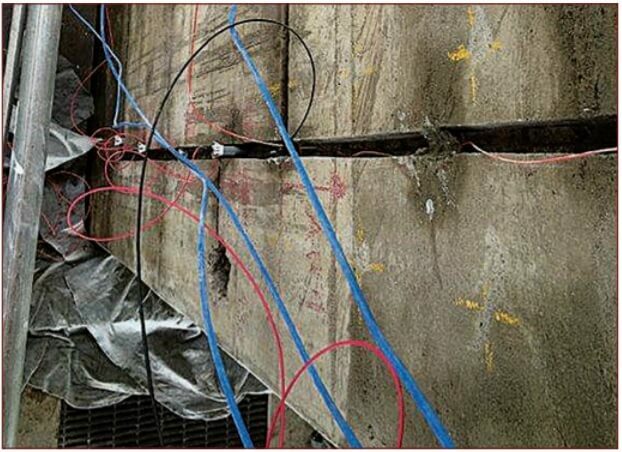 Preliminary laboratory results suggested that applying ICCP to a reinforced concrete structure over a period of time can transform the environment around the reinforcement, even after the protective current had been interrupted. Applying cathodic protection to a reinforced concrete structure is accepted as a cost effective way to transform the environment around the reinforcement, and move it from being aggressive to passive. This transition is achieved by chloride ion removal and increased alkalization through the reduction of interstitial water and dissolved oxygen. Under these changed conditions, the microenvironment is benign and so corrosion ceases. The key finding of their research was that, in the event of the impressed current system being interrupted for long periods, the steel remained passive for at least 52 months, even in the presence of chloride ions, on highway structures in the UK and Australia. Even in the more aggressive environments associated with marine structures, it was shown that in the majority of cases examined, steel potentials moved towards more positive values that suggest passive conditions were maintained. Repairing marine structures is especially problematic when they have been made of reinforced concrete. This is due to a combination of heavy wear and abrasion from wave action and inter-tidal saturation with salt water means that chloride-induced corrosion can advance very quickly. [Corrosion engineers are] working with Dr. Christodoulou to ensure that the proposed hybrid anode system will work effectively on the Auckland bridge. Some of the original piles were installed over 40 years ago, and appear to have lasted well according to assessments. Utilizing corrosion potential mapping, the overall environmental condition of the piles within the concrete proved to be successful. This mapping was conducted at the concrete’s surface with either a silver/silver chloride or copper/copper sulfate half-cell, in electrical connection to the existing reinforcing. Following installation of the relevant reference electrodes on a predetermined grid design, a series of titanium manganese dioxide anodes were installed. (Background reading: Cathodic Protection and Anode Backfills.) This allowed the designer to measure the effectiveness of both the impressed current and cathodic protection systems, using readings taken from inside the pile structure. These readings were collected via a data-logger and the results were relayed to the designer, which facilitated the optimal placement of the hybrid anodes. Following confirmation of this plan the anodes were then installed in drilled holes and connected via titanium wire. The advantage of such installations is that in each location the designer has the ability to adjust the amount of current to selected zones, depending on whether the area is predominantly a tidal, splash, or atmospheric zone. Once a suitable current has been passed in this impressed current phase and the zone is appropriately passivated, the power supply can be removed from the appropriately passivated zone and a galvanic phase of protection is initiated. In the case of marine structures, steel is typically de-passivated by chlorides migrating through the concrete from the external environment, building up in sufficient concentrations at the steel-concrete interface to damage the naturally protective iron oxide film. Once de-passivated, iron oxides and hydroxides develop at the anode as a result of oxidative hydrolysis of the primary corrosion products. The resulting massive volume expansion provides the driving force for the spalling of the concrete cover on the steel reinforcing bars, exacerbating the corrosion problem. Concrete patch repair is a common technique for this challenge, involving the removal of physically deteriorated concrete, cleaning the steel reinforcement and replacing with a repair mortar. However, in many cases further corrosion is soon observed around concrete patch repairs. This phenomenon is usually known as incipient or ring anode formation. Corrie is the director of Alice Marketing & Communications Ltd and has a strong interest in engineering, environmental and sustainability issues. She has written for a wide range of engineering and business organizations on work that covers corrosion, bioremediation and sustainability. Corrie has been associated with the publishing industry for 30-plus years and has been editing the ACA NZ Bulletin since 1995 and writing articles on their behalf since 2012.